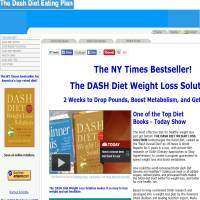 The DASH Diet is made up of a series of books (or e-books) which come highly recommended by the New York Times. They work on a 2 week cycle, although can be mixed and matched to help you maintain weight loss, with 4 different texts and diets available. The DASHdiet texts are available for Kindle and Nook, plus Apple devices through the iTunes store. As such, online content is limited. You can join a Facebook group, which is a good way to get a sense of how well the diet works, as well as asking for recipes and advice. DashDiet.org also has links to various devices it recommends to help monitor your fitness, including Misfit Shine, Garmin Vivofit and Fitbix Flex. The diets are easily downloaded through the relevant portals, and printed texts are available through Amazon (though these can be considerably more expensive). The diets work on a fairly basic premise: eat lots of vegetables, high protein and low fat items, light dairies, fruits and seeds. It doesn't provide any exercise regimes or stress the need for working out to lose weight, but if you’re interested in this element of weight loss then you ought to pursue it elsewhere. There are 28 days’ worth of meal plans and more than 40 recipes to try out. They also take various dietary requirements and health issues into account, such as foods for diabetes sufferers. If you want to know what the meals might be like, the website provides sample menus and a few photos of the recipes once they’re cooked. As for online tools such as calorie counters, BMI calculators, diaries and more, unfortunately none of this is available with the DASH diet. However, you could combine this resource with another (potentially free) website which offers the tools you require. Those things taken into account, the DashDiet is quite limited compared with its peers. Although the diet itself might be good, and the books are probably quite helpful, the lack of tools to assist the e-books makes this a much less attractive proposition. We recommend checking out the sample menus and additional samples provided from the DASH e-books. It might even be worth taking a look at their Facebook support page to see what other members are saying about it, helping you to decide if you’d like to make an investment. Prices can vary quite considerably, though we did find the Weight Loss Solutions book for just $3.99 on Amazon, so it’s not always a big investment if you’re not willing to take much of a risk.